Donna Fehrenbach loves to bake. Born on a farm in rural Wisconsin, she started baking bread when she was ten years old. As the years passed, she and her husband, Paul, who happens to be one of our early volunteers, eventually settled in Fearrington Village in nearby Pittsboro, North Carolina. Now retired, she teaches baking classes in the community. The homemade goods from these classes are donated to the local food pantry. One day as Donna was driving down our street, she had an epiphany: How could she contribute her bread making skills in service to our guests? So, she contacted Allison Worthy, our Volunteer Coordinator, and together, they came up with the plan that each Tuesday morning, Donna would come to Family House and bake bread for our guests. 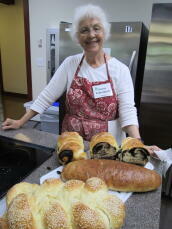 Donna arrives around 9:30 a.m., oftentimes with bowls of risen bread that she’s prepared at home. As she readies the dough for baking, the kitchen doors are constantly opening and closing with house guests, volunteers and staff who’ve been lured by the sweet smell of her breads. Some folks assist with the baking process. Some engage in conversations with Donna. Some get baking tips from her. Everyone stops for a moment to get a taste or two or three of her breads: basil breads, cinnamon rolls drizzled with icing, dark chocolate breads, multi-grain breads, cinnamon herb breads, with each morsel melting in our mouths.